In March of this year, VCA Lecturer in Sound Roger Alsop invited me to participate in a project he was developing with Andy Howitt the Director/CEO of Ausdance Victoria named Sublime. The project involved two weeks within the main ballroom at the Substation Gallery in Newport together with other artists, composers and dancers developing cross-discipline performances. There was no top-down directive on what we should be making, no themes were given; instead we were encouraged to ‘play’ and allow works to develop naturally over the course of our time in the gallery. Within the group were dancer/choreographers from the Menagerie Collective, Rachel Heller-Wagner, Ashlee Bye and Moriya Rosenberg, composers Camille Robinson and Jess Keefe, visual/sound artist Mark Pedersen and myself, Travis Cox. Over the course of the two weeks we developed a rapport that allowed us to create cohesive works that reflected the various interests of those within the project. The most important thing for us all was that the different elements; sound, dance and visuals, worked together and responded to each other rather than fought for space. To this end we began to employ interactive technology such as the Microsoft Kinect and a Bluetooth-enabled gyroscope to allow the sound and visuals to respond to the choreography (and vice versa). Choreographer/Dancer Ashlee Bye during early development at the Substation. Photo: Travis Cox. The process for developing the performances within the space involved a great deal of give-and-take. Each of us came with previous creative energies but with no top-down direction it was up to us to make connections with each other and find commonalities from which we could draw and develop harmonious productions. The first few days everyone was a little standoffish but we quickly got to know one another and felt more comfortable expressing our interests and offering constructive critique on each aspect of the work. After the two weeks were over we were left with three short performances, one using a Kinect to delineate a border in which a dancer performed- if she moved beyond that space the sound would modify in response. A second work involved a dancer performing a work that in which she aimed to move her upper body slowly while her lower body sped up- we attached a gyroscope to her arm and created visuals that were generated to move in sync with her upper body while her lower body performed quickly in front of the projection. The third work involved a large-scale inflatable that we came to call ‘the worm’. 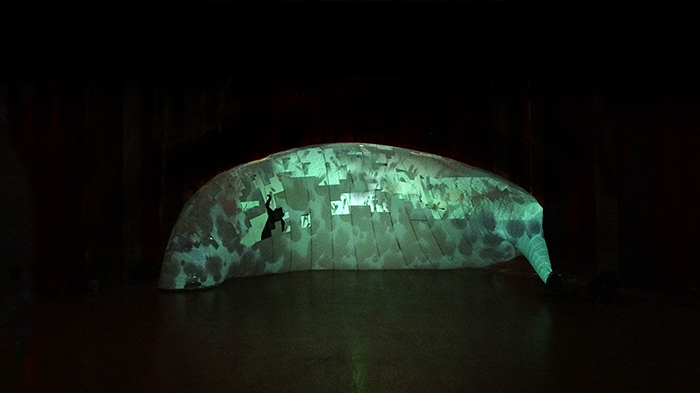 The inflatable was large enough for the dancers to perform both around and also inside of- onto this we projected simple visuals that responded to audio composed during the project. A video produced showcasing the in-progress performances developed during the original Substation residency. Post-Substation we all wanted to keep momentum going for the project and luckily an opportunity came through a call-out for Dancehouse in North Carlton. They were seeking EOIs for their Melbourne Fringe program- and in deciding to apply we had to develop a narrative arc for the show. Mark mentioned this concept of the Infundibulum from Kurt Vonnegut’s The Sirens of Titan, the Infundibulum being the place in which all time and space meet- where everything is possible. Drawing from this concept and through further reading of the novel we found the concepts of free will and control in the narrative connected well with the performances we had already begun to develop. We eagerly developed our application and successfully gained a place within the Dancehouse schedule. Dancer/Choreographers Ashlee Bye and Rachel Heller-Wagner look to the future while wrapped within ‘the worm’. Photo: Travis Cox. After successfully gaining a place within the lineup we continued to meet as a group to develop the narrative arc and concepts for the show. We laid out four acts that corresponded with the four planets visited by the characters within the Sirens of Titan novel, Earth, Mars, Mercury and the moon of Saturn, Titan. We’ve honed the projections, sound and choreography while also seeking to enhance how we explore control by developing a system of wireless buttons that certain members of the audience will be given. These buttons give control over the choreography, sound and projection to the audience during the second act while the dancers seek to escape the brainwashing Martians. An inflated and active ‘worm’. Photo: Travis Cox. In July we were lucky enough to be given access to the Substation for another two weeks of rehearsals for Infundibular- two weeks in which we had the space to finalise the staging for the show, make sure all the technology worked correctly and lock everything down. Since then we’ve been biding our time- checking our systems, preparing for take-off and plotting our course around the solar system! We’re really looking forward to sharing the show with the Melbourne Fringe audience at Dancehouse next week.